Hi I've been a semi-active Wow player for 11 years now and been a part of a Raiding Guild for several expansions. 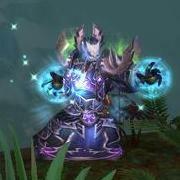 Usually I just get by on the guides here on icy-veins or other similar sites for talent and gear recommendations but for Legion it seems in order to tell if something is really a good upgrade or not I'm going to have to start Simming my character myself. Can anyone here recommend a good guide on how to get started with it? he armory doesn't store any information about your Netherlight Crucible choices. This means that Raidbots won't be able to find it. You will need to put the information in yourself. The easiest way to do this is, as it suggests, by downloading the SimulationCraft addon, which you can find here. Copy this text and paste it into the "Load from SimC Addon" window. This will give RaidBots all the information it needs on your character and it will "save" anything the armory doesn't provide, so that you only need to use the SimC Addon again if you change something on your character. Once you have done a simulation with the Addon input, it automatically saves your Crucible data, for example. If you see the error that no Crucible data is available, you need to read the section above about importing your character. If you know that you want a fight style that is different from a Patchwerk fight, you can change it on the drop-down menu. A particularly useful one is the "Casting Patchwerk" fight, which can be great for testing the value of the Sephuz legendary, for example. If you are trying to maximise your cleave performance, you can change the number of bosses or change the Fight Style to an add fight. If your group is heavily overgeared and consistently gets very short fight lengths, you can reduce the fight length. Likewise if your group gets very long fights, you can increase the length. You can increase or decrease the number of Pantheon trinkets in your raid to better mimic your own raid group's number of them. This page shows you the amount of DPS you are "simulating", as well as the stat weights for your character. If you want to run another sim with different parameters, you can always just click "Back to Stat Weights" and change what you need to.